Europeans As Mongols of the Sea? No. Anti-European propaganda in the USA never rests. Fox News (basically) proclaimed Paris the Most Dangerous City in the Universe. Obama himself helped. Hugely erroneous ideas and theories about historical facts are necessary to feed hugely criminal systems of thought. Paul Krugman, per the general American anti-European mood, not to be overtaken by Fox or Obama, suggested that Europeans were “Mongols of the Sea”. I will show why this is, mostly (yet not completely,) wrong. The mood, though, is as wrong as wrong can be. Geography is destiny. Does that mean superior geography is superior destiny? What about… human geography? History is culture, intelligence. Does that mean that a richer history is a richer culture, intelligence? Why did the Mongols invade all over the place, from Palestine, to Poland, to India, Korea, Japan, and Indonesia? Geography is destiny: they were at ease in the central Eurasian steppe, the world’s greatest grasslands. 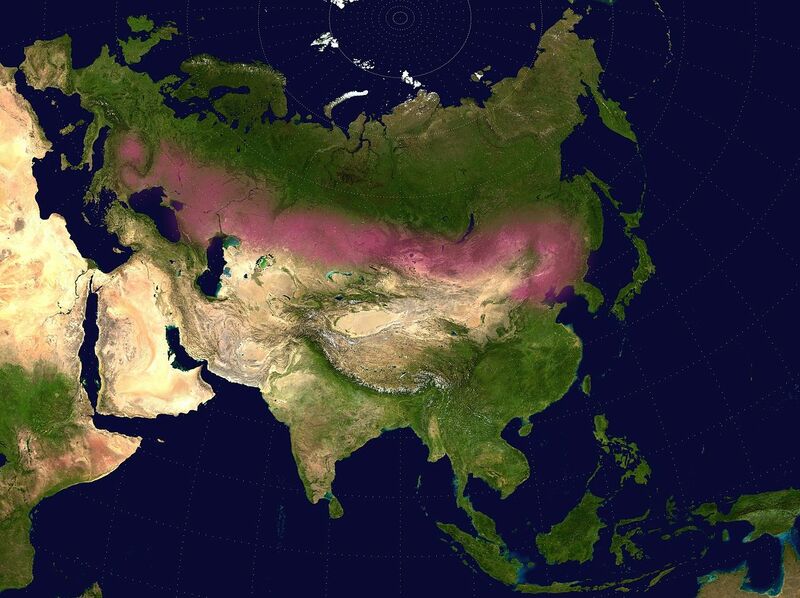 Eurasian Steppe in Pink. Notice How Green & Full of Coastlines Europe Is. In his book “Gun Germs and Steel”, Jared Diamond suggested that Europeans had lots of everything because Europe has had lots of everything to start with. Diamond had a chicken and egg problem. He was both chicken, and egg. Both scared, PC, and embryonic, not even. The idea that geography is history is very old. It’s not just found in Braudel’s concept of Hydraulic Dictatorships, but also in the ancient Greek observation that Greeks were around the Mediterranean Sea as frogs around a pond (Herodotus). Diamond observed that Europeans had plenty of domesticated animals and plants. So European material superiority was just happenstance (and not caused by their superior race, or culture). That was, however, silly. Domesticated animals were evolved by man. Husbandry of animals was the robotics of the past. As the Franks learned to manage (what they called) Europe without slavery, they replaced slaves with animals and mechanical advantage. A new mood was born. So doing, the Franks fabricated a mood of Freedom and Creativity. Harsh, massive, satirical critique of the Catholic Church, started in the Twelfth Century. The Pope reacted by killing millions (the Cathars, and then Valdese) and inventing the Inquisition. The philosopher Alain Badiou, a far left anti-racist rather Marxist fanatic, yet one of the top professors in France, admitted recently that “only Europeans think”. As a French government campaign of the 1960s crowed: ”In France, on n’a pas de petrole, mais on a des idees” (or, more exactly, used to have ideas…). Of course, we can argue that, and it’s true to some extent, but not to another. When Caesar got to the Atlantic coast of Gaul, he was astounded by the multitude of high, large, ocean going Celtic sail ships. (Early Roman galleys defeats against those ships turned into victory after Caesar forces invented a particular device, the crow.) By the Sixteenth Century, and probably earlier, the Basque fished massively cod off Cape Cod. Isaac Asimov, by the way, did not invent psychohistory. He just invented the label. Psychohistory is in full evidence in Herodotus. A question is why the Mongols were Mongols. Well, the world’s largest steppe extends from Manchuria to Hungary. The place where it had the largest extent, after South Russia switched from savagery, nomadism, hunting, gathering and trapping to agriculture, was, precisely Mongolia (not suited to agriculture). Nomads are war like, they naturally attack and exploit peasants (see Arabs and Islam for a similar situation). After the Amazons and the Scythian empire got replaced by peasants, the Mongols were free to pay visits, with their nomadic war style, from one end of Eurasia to the other. It’s actually the Huns who got the ball rolling. They tried to conquer Western Europe, but were defeated drastically in Gaul. First the natives in Orleans apparently surrendered their city, just to ambush them. Retreating, Attila’s giant army was then shadowed and harassed by the Frankish army. Finally, cornered, the Huns were near-annihilated in Champagne by a Franco-Roman and Gothic coalition (Aetius, the Roman commander, who had been raised among the Huns, saved them, in a weird turncoat maneuver). The Mongols of Genghis Khan were direct descendants of the Huns of Attila. They remembered all too well what had happened between the Franks and the Huns: here is psychology again. Actually the Mongols made precise considerations on military effectiveness: composite bows go soft in the wet forests of Europe, and little Mongol horses were nothing relative to giant Frankish war horses. After a costly victory in Hungary, they decided to stop. Some of their vanguards had reached the Adriatic sea in Croatia. Instead the Mongols allied themselves with the Franks to conquer Baghdad and Damascus… The alliance was nipped in the bud by the racist Saint Louis, Pope, and a difficult Mongol empress. In the end, the Mongols became Muslims (as the Pope apparently hated Nestorian Christianism more than he hated Islam). The Mongols did not have an industrial basis. What they did have, as Huns, or, four centuries later, Avars, and still another four centuries after that, Genghis Khan’s tumens, was super military training (as did Muhammad’s Arabs, for the same reason… Or the North African Saharan Berbers they allied themselves with to annihilate Christian North Africa)). Europe, by contrast, had a superlative technical and industrial basis: the Celts provided the Roman Republican army with swords (Spain) or thin light metallic helmets (Gallia). The Celts, as I said above, gad ocean going ships that none of the Mediterranean people, not even the Greeks, had. It’s the conceptual descendants of these ships which allowed to send large armies across the Atlantic in the Fifteenth Century. The outlawing of slavery in the Seventh Century forced Europe into high science and high technology. The construction of cathedrals is the proof of this: although superior Roman concrete had been forgotten, the cathedrals used iron in a crucial way. Said iron structures were too strong to be manipulated by hand, so hydraulic hammers had to be invented, and they were. After Augustus lost three crack legions and their supporting troops in Northern Germany, Rome stagnated militarily. That led to an ecological collapse, a military collapse, and then a demographic collapse. The Franks inverted the avalanche of collapses by conquering Germany, and finding enough silver in Eastern Europe to reconstituting a hard currency (routinely boiling counterfeiters helped). The Mongols had superior military organization, still they knew they were no match for the Franks (the conversation between the top Mongol generals about this are in the Secret History of the Mongols). The Europeans, though, set-up superior organizations in roughly all domains. This is what the plutocrats are hell-bent to destroy presently. Do not forget that Greek plutocrats (the friends and “Executors” of Aristotle) and Roman plutocrats, did not hesitate to destroy the civilizations which had produced them. Our plutocrats are not any different. Comparing Europeans to raiders of the steppe can only help. But did the English Colonists who invaded North America succeed to do what the Mongols failed to do, and the Nazis also failed to do, namely to exterminate most of the Natives? Certainly so. Thus Americans became, de facto, what the worst Mongols dreamed to be: not just ruthless conquerors, but thorough terminators. This ruthlessly terminating, not to say exterminating, mood, is, no doubt, still with us. That’s why Bush went to kill 500,000 , or more, in Iraq: just because he could. This entry was posted on January 20, 2015 at 11:00 pm and is filed under Barbarians, Systems Of Moods, Systems Of Thought, Violence. You can follow any responses to this entry through the RSS 2.0 feed. You can leave a response, or trackback from your own site. Yes, funny obama gives unbearable lessons to the French and British about not being rough with Muslims, when the USA just killed at least one million Muslims in the last 25 years. Most of them children and women. These are serious numbers found in medical journals. See The Lancet..
Obama is just an actor. But a good one. All American politicians are actors. “This ruthlessly terminating, not to say exterminating, mood, is, no doubt, still with us. That’s why Bush went to kill 500,000 , or more, in Iraq: just because he could.” It is also with Islam. In addition, Islam has a closed mind. How will it work out? Yes, Partha, indeed. The Americans could kill all the “Indians”, oops, Native Americans, because it was all in the Bible. Islam is a war religion, and was crucial in an instant karma of the greatest empire that ever was, in less than a century (632 to 711 CE). Islam was nothing in 1950. It’s the USA Dark operators who pushed it, as they did with Nazism, or Stalinism. Stalin, they gave half of Europe. Before, USA plutocrats had developed Caucasian oil for Stalin (bringing capital and tech: the Harrimans, pillars of the Democratic Party…). To the Nazis they gave everything, including weapons and oil. To the Muslim Fundamentalists, they gave the Middle East, as a USA fief. It appears to me that in USA, nobody understands history. Am I right? Well, Partha, in the USA not too many people want to understand history. Several times, I saw closest “friends”, American “friends”, go completely ballistic about historical questions. Terminally ballistic. There are a number of subjects one cannot talk about. The question of Nazism and the USA is one of them. Although now many are against the Iraq war, but, 11 years ago, one was “anti-American and a Jihadist, if one begged to differ. Good points all. Especially the terrified to think part. You simply cannot get a conversation about ideas at one of these affairs.. But in my experience, besides the damn sports scores, at parties they also obsess about real estate (probably an aspect of the money thing). My interest in either of those subjects is about the same as my interest in the varieties of sod available for suburban lawns. So I believe I am considered somewhat odd or eccentric. Right, I forgot real estate. It used to be the end-all, be-all. I remember ladies coming to me with their eyes jutting out of their sockets, and asking me at first sight: “Have you been pre-approved? You have to be pre-approved! That’s the only way to make it.” Now they have calmed down, but in some parts of the Bay Area, prices have doubled in 6 months. All frantic speculation. Wealth and great investing acumen flaunted is a perennial. I don’t amuse them very long. Interesting that you should mention the crucial role of animal husbandry. That oxen could provide lots of meat and power was widely recognized across the civilized world, including Europe. But Europe never divinized them. It did not put high priests in charge of worshiping Apis or Mithra at great cost. It did not put a taboo on the consumption of divine beef, cluttering its streets. with parasitic sacred cows. Instead it perfected the art of hobbling, castrating, training, selecting and harnessing the beasts, nullifying their natural tendency to gore and stampede. Not to mention, cooking them. Here is a new twist to spread of languages and consequences. It is now shown by natural events (the Toba explosion) that India was populated first after a super volcanic explosion 65k yrs ago which wiped out all populations in Africa leaving about 1000 in India. These hung on for the 5k years of cooling (volcanic ash winter) and the ice age (till about 30 kyrs ago). After this the earth began warming and people and animals grew in numbers. Languages increased in numbers. In India there were two families one based on Sanskrit and the other based on some differences with Sanskrit referred to as Gauda Sanskrit ( north)and Dravida Sanskrit( South). The two are much closer than Sanskrit and Indoeuropean. There were out migrations from India in two waves, one in 30 kyrs ago and one in 10kyrs ago. Cattle, horses, pigs, elephants were domesticated in India and travelled with the languages and agriculture to Europe. Elephants did not. It is not needed for agriculture. Field mice also went with the people. The European field mouse is related to the Indian mouse. Horsres were bred in Spain also. Cattle of the type in India is also in Europe. (The zebu).the proto Indo European has not been derermined because it pertains to the earlier outmigration 30000yrs ago. the early mother goddess Cybele is the mother goddess in India, her symbols being used on wedding talismans showing the earliest religion is also from India. https://m.youtube.com/watch?v=T8Jl5Qft0oY for details, a fascinating talk. Dear Partha: Before I say much more, let me confess I don’t believe in “genetic bottlenecks”. I believe they are artefacts of present genetic analysis, which is parsimonious. They test only samples within samples. There are some 75 known breeds of zebu, split about evenly between African breeds and South Asian ones. Cybele was all over the place, all the way to Greece. She was a facet of the Great Mother Cult. That’s why the Christians invented Mary (actually borrowed from religions between Cybele and Greco-Roman antiquity). I did not know she made it to India. Hi Dominique! Yes. Animal domestication was fundamental to the European project (European progress?) it’s no accident that dogs came from EUROPEAN wolves (not Chinese, Indian, or African wolves; yes there are still African wolves in Ethiopia, a few hundreds). No racist theory necessary to explain this: Europe in general, and France in particular was all crossroads, in a rich land, for tens of thousands of years. Notice that goats have long been viewed as the devil. BTW, when oxen were domesticated exactly is not clear. Some Hungarian prof suggested long ago that this happened more than 20,000 years ago. Thanks Gerald, and welcome (your comments ought to go through immediately from now on).